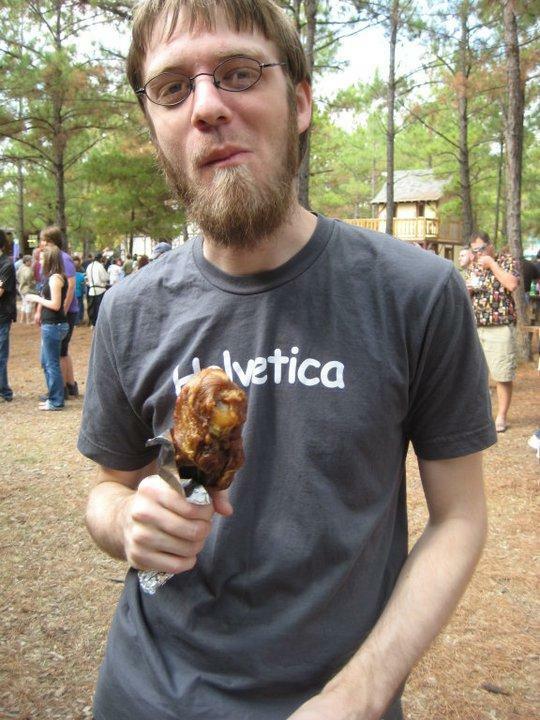 Join us as we talk to developers large and small in the webOS community. This week: Geoff Gauchet. Are you a developer interested in getting spotlighted? Hit us up! 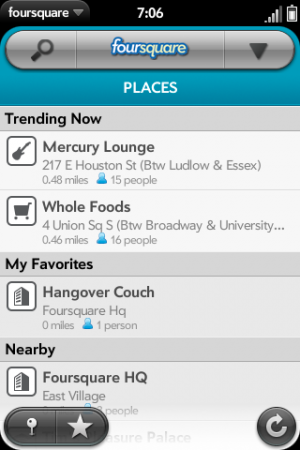 webOS Apps (released/upcoming): Released: foursquare, neato!, growlr. Upcoming: incredible! Tell us about yourself. Really, we want to know. I'm a web developer/designer for a local non-profit here in New Orleans. We do some really awesome health- and community-related projects that push the envelope. It really challenges me with design and user experience and there's some crazy data crunching that takes some thinking. I'm engaged to an awesome girl who is hands-down the best cook/baker I know (Irish car bomb cupcakes, anyone?). I'm an Internet junkie. I'm an NES aficionado. I wear a tie to work even though I'm not required to. I hate that I just ended a sentence with a preposition. I love puns, beer, dessert, bacon, and pointless trivia. I love using Oxford commas. I use a Mac. I think portmanteaus are amazing. I wanted to be a UPS driver when I was a kid. I like a variety of music from The Beatles to Cursive to Notorious BIG to mc chris to Iron Maiden to Johnny Cash to Bobby Darin. The first program I ever wrote was a tic-tac-toe game I wrote in BASIC in second grade while everyone else in class was searching for Carmen San Diego. I ramble a lot. Oh, I want to also finally, once and for all, give official pronunciation for my Twitter handle/company name: The "Zh" makes like a "z"+"h"+"s" sound, like in "fusion". The "e" is an "eh" sound, like in "let", the "ph" is an "f", and the "ree" is, well, a "ree" sound. It's a play on my name (Geoffrey, or, for those that have never read Canterbury Tales or shopped at Toys 'R' Us, it's the same as Jeffrey, but way cooler because my way is the real way). It's not "ZEE-free", though, I will accept "ZEH-free" if the "zh" sound is too much for you. It's a cross between the French pronunciation of my name (the "Zhe" part) and the English pronunciation (the "phree" part). And now you know! And knowing is half the hassle. 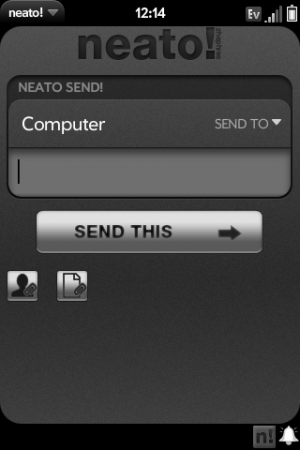 What in your background led you to develop for webOS? I'm a web developer and designer by trade, both as my day job and freelancing, so webOS was a natural fit for me. I've also had some history of developing random little Visual Basic apps. They were always small applications that either did some task that other apps didn't do (like Artie, The Strongest App in the World!, which would fix all your iTunes music metadata. Even created playlists based on dominant album art color) or I didn't like something in an app, so I'd make my own that did it better, like a Notepad clone. Since webOS was new at the time when I got my first Pre, this was right up my alley: I could build apps that did things I needed it to do since it probably didn't already exist (hence, foursquare). Why do you continue to develop for webOS? Well, the first answer is that I already know it. It's easier to continue developing for a platform with which you're familiar and uses tools and language you already know. I barely have time to work on webOS apps and I know the platform forwards and backwards. I couldn't imagine learning a new platform or language right now. The other reasons are the community. If I have issues or problems or an idea, I know I can tweet about it and get some responses back that are really helpful. Plus, the folks at HP and Palm are amazing. Everyone I've met or talked to over there have been nothing but helpful and nice. It goes a long way. I also develop for webOS because here, I can be a big fish in a small pond. Wait, that sounds cocky, but it's true. If I dove into, say, iOS development, no one knows who I am and chances are, my app idea already exists on the platform. And now that I've gotten in on the ground floor with webOS if and when it explodes and gets a larger user base, I'll already be established and continue to have loyal and good customers. Do you do any development for other platforms? If the web is considered a platform (which, it probably is these days), I develop for that. And how does your webOS experience compare? What’s your take on the current state of webOS development? Honestly, it's nerve-wracking, convoluted, and discouraging. I'm always really positive about webOS and Palm/HP, but you somehow Barbara Walters'd that out of me. I love webOS and HP/Palm and everyone involved. As long as webOS is on a device, I will own a webOS device and convince others they should too. But, right now, things are rocky and they will be for a little while. Chuq and Lisa and tons of others at Palm have said the same. It's hard to think that all of the code I've written in the past will be essentially worthless in the coming months (hey-o!) and I'll have to rewrite all of my apps. It's annoying that because I'm spending time maintaining existing apps and finishing up half-finished apps, all the new stuff is passing me up. I'm feeling like all this Enyo and webOS 3.0 stuff is moving on and others are able to move forward with new technologies and projects and I'm still adding features to foursquare and trying to finish incredible! and testing them on my 1.4.5 device. It's starting to feel like I'm Bart in that episode of The Simpsons when he prays for it to snow so he won't have to go to school, but he ends up having to stay inside and write his report anyway and he's watching all of his friends outside, playing in the snow. But, that's mostly my own fault. I've got a lot on my plate and this was bound to happen and this is why it's awesome that we have a team like the people at HP/Palm. They make all this easier. Mojo support will go on for a little while, which takes some pressure off and the team over there is super helpful. Could more information about the transition and the glitches resulting from it be communicated officially? Absolutely. Things like having to package apps with the --use-v1 flag to submit them to the Catalog for 1.4.x devices should be noted somewhere other than Twitter or some buried thread in the early access forums. But, they're dealing with a lot of the same types of issues we developers are and there's a lot more going on behind the scenes over there that really pulls them away from that type of stuff. I'm just happy they're all accessible enough so that I can ask questions and get a response quickly. It's all a little confusing on deciding how to write your apps right now. I know some guys have ended Mojo development altogether (save for maintenance releases for existing apps), and more power to them. I, on the other hand, am really reliant on 3rd party APIs in apps like foursquare and growlr. As those young companies continue to grow, so do their feature sets. This means that after I froze development for foursquare, I had to start developing on it again because foursquare added a slew of features that not only my users wanted, but I did too. Since webOS is my primary device platform, if I want a feature in foursquare, I have to make it. It's frustrating. But then, I do it to myself, too. I wanted to get an Untappd app out quickly and Enyo is still, well, not here yet, so Mojo was my only option. Sure, I got the app out in less than a week, but now it's another "legacy" app I have to support and eventually rebuild. I guess that long ramble was just me saying: it's frustrating sometimes, but it's partly my fault, but I see it getting better soon, so I'm sticking with it. Where do you see webOS development going in the future? In particular, how do you see Enyo and devices like the TouchPad running webOS 3.0 affecting your development? I see my apps being better. The foursquare app, while a good app, is terribly written. The code's sloppy, there are memory leaks, it can be slow at times. This is all because it was my first webOS app and I just kept bolting on new features so a lot of old inefficiencies linger. If I were to rewrite the app from scratch today, it'd be lighter, faster, and all around better. So, I see my Enyo apps being just that: better. I'm really looking forward to that. The TouchPad opens the doors for a whole bunch of new apps. I mean, incredible will be great on a phone, but can you imagine how beautiful and open and "immersive" it'll be on a tablet? I keep saying it, but incredible! was born to live on a tablet. I think the TouchPad (and Enyo) will allow me to make incredible! my "Symphony No. 5". Wait, that's too pretentious, I should scale it back: I think the TouchPad (and Enyo) will allow me to make incredible! my Big Mac. I hope that it'll be some of my best work and the TouchPad will allow me to do that. Given the chance, what’s the one thing you would change about the webOS development process? 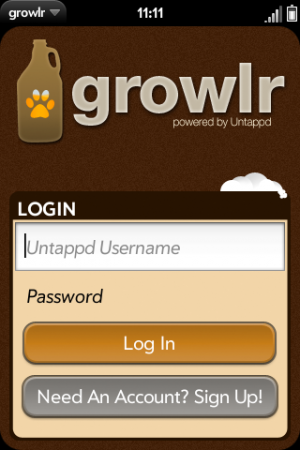 Well, I just launched growlr, my Untappd app. Untappd is basically foursquare for beer. Right now, it's a basic app that allows you to check-in to a beer, but that's about it. Mainly, I wrote it to compensate for the fact that the webOS 1.4.5 web browser doesn't support geolocation. I plan on updating this some more in the semi-near future. I've got a few app ideas bouncing around in my head (including possibly one I'll be collaborating with my fiancée on), as well as some non-app ideas for webOS that'll make developers' lives better. These are all on hold until my current projects wrap up, and with the flux of the development situation, some are better left for the future. I’ve gotta ask: what’s with the lowercase adjective app names? Good question! I actually came up with the name for incredible! before I even knew what it would be. After I came up with the name, I came up with the theme, and then I decided on what it would be. I just thought an app that was incredible should do a lot of stuff. I added the exclamation point when I made the logo for the splash screen in my mock-ups because it looked good opposite the lowercase "i" since it's essentially an inversion of it. The "i" was original an uppercase "I", but the uppercase "I" in the font I used looked boring, so I went with the lowercase. When I got the idea for neato! I figured that it was a small, quick app, so it needed a small, quick name. "Neato" seemed to fit and I figured it was a spin-off of incredible, so, I stuck the exclamation point on it, too. And since incredible was already lowercase, I made neato lowercase too. The official spelling of foursquare from the company is all lowercase, only using the uppercase "F" when the name starts a sentence. Since at this point, my three other apps were all lower case, "growlr" was lowercased and I dropped the "e" since Untappd did the same. Will I keep up the theme? Possibly. Depends on if becomes annoying or silly. But, you can be assured that all my apps will likely be lowercase and ones based on other people's APIs will not have punctuation, but original ideas of mine possibly will. I like the idea of the branding and people knowing that [lowercase adjective] plus [exclamation point] is probably a Zhephree app. Thank you so much for your time. Any parting thoughts for the webOS community? Stick with it! Don't give up -- keep writing awesome apps and don't flip out at every little development with webOS. Keep your head down, work hard, and it'll all pay off eventually. And don't do it alone! Find someone to bounce ideas off of that won't placate you and will actually tell you when something is stupid. They don't have to be a developer either. Rhea (my fiancée) is like my human whiteboard and helps me brainstorm on everything. As for non-developers: same thing! If you're not happy with webOS, hang on! I think things are just getting (re)started! And every time you feel the urge to complain about something, grab a friends' webOS device and purchase neato! on it!